Poor Winnipeg, always getting the shaft. If it’s not Ilya Bryzgalov complaining about a supposed lack of parks, or the San Jose Sharks ripping on Winnipeg’s climate and alleged poor WiFi, then it’s the rest of Canada ranking the Gateway to the West (“Winterpeg,” for non-politicians) only slightly behind Hamilton as the nation’s easiest city to make fun of. Even their hockey teams haven’t had an easy ride. In late 1971, the city was awarded a professional hockey franchise that would begin play the following year. Unfortunately, the Winnipeg Jets were to play in the World Hockey Association, a troublesome, tumultuous seven-year venture that ended with the National Hockey League absorbing four of the six remaining WHA teams in 1979. But that’s okay, because at least they had some fun along the way, right? I mean, they made the playoffs in six of the WHA’s seven seasons, winning the Avco World Trophy three times and playing for the championship on two other occasions. On the other hand, the most prolific players in team history – WHA history, too – were Anders Hedberg, Bobby Hull and Ulf Nilsson. Together composing the “Hot Line,” all left rather unceremonious legacies. Hedberg and Nilsson bolted for the New York Rangers in the summer of 1978, while Hull was later revealed to be a less-than-savoury character off the ice. Ah, but the move to the NHL provided an opportunity for the Jets to reinvent themselves and again reach the precipice of their domain. Unfortunately, ascending with the Jets throughout the 1980s were fellow Smythe Division powerhouses the Calgary Flames and the Edmonton Oilers. Winnipeg made the playoffs eight of 11 seasons between 1979-80 and 1989-90, playing either Calgary or Edmonton in all but one year. 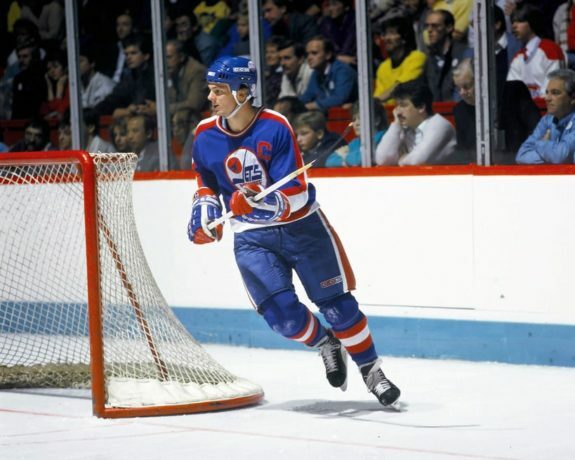 Despite fielding a roster that included the likes of Dale Hawerchuk, Paul MacLean, Thomas Steen and 1981 Norris Trophy winner Randy Carlyle, the Jets were only able to get past the first round twice (in 1985 and 1987), both times at the expense of the Flames. Also on both occasions, they were then promptly swept by the Oilers. In 1990, the Jets were finally able to push the Oilers, now sans Wayne Gretzky, to the brink of elimination, before blowing a 3-1 series lead and losing in Game 7. Of particular note, Game 6 in Winnipeg was delayed by an overzealous fan throwing popcorn on the ice, jinxing the Jets, according to some. The Winnipeg Jets: Always the bridesmaid, never the bride. The current iteration of the Jets came about in 2011, thanks to the relocation of the Atlanta Thrashers, with NHL Commissioner Gary Bettman showing all the enthusiasm of a hostage on a ransom video. Will this edition prove more successful? We’ll just have to wait and see. It’s too early to call. Only time will tell. Other analytical cop-outs. One thing’s for sure: They won’t be winning any awards for their uniforms. The Jets were a brand-new team in a brand-new league, debuting in the WHA’s inaugural season of 1972-73 with a uniform set that…well, looks like the uniform set of a brand-new team in a brand-new league. The centrepiece of the jersey is the logo, a pretty generic-looking “Jets” wordmark flanked on the left by a hockey player in flight. Not exactly inspiring iconography for a fledgling fanbase, though the “J” in Jets does look rather good doubling as a hockey stick. Nor were the backs of these jerseys any good, with the contrasting nameplates and Comic Sans-esque typeface providing all the professionalism and distinction of a house-league peewee team. That all said, the bones of these kits are really rather good. Gapped tri-stripe patterns on the sleeves and tails, a feature replicated on the socks, give the uniforms a crisp, traditional feel, while the utilisation of the classic blue, red and white colour palette provides just enough contrast – thanks in large part to red pants – to make the kits sufficiently interesting to look at. The no-nonsense number font, complete with flush trim, even lends a hint of aggressiveness to the ensemble. The white jersey is especially good, with contrasting cuffs and shoulder yokes, to go along with a red collar. The blue uniform could do with a bit more contrast, particularly towards the top of the jersey, something which would be rectified the followed season. 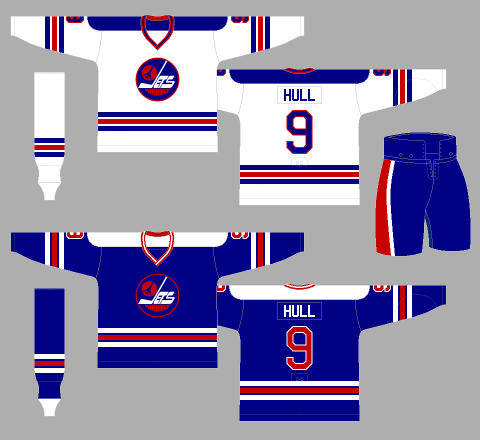 Generally speaking then, the Jets’ first attempt at a uniform was pretty much what you’d expect from a new team playing in an upstart league: Conventional enough to be attractive to the masses, with enough zaniness thrown in to make the WHA stand out from the NHL. A great idea, with thoroughly mixed results in execution. In only their second season of existence, the Jets decided to overhaul their look, debuting the now-classic logo that, with some changes, would stay with the team through their transition to the NHL, right up until their move to Phoenix ahead of the 1996-97 campaign. As you can see, many of the issues with the original uniforms have been rectified, with a contrasting neckline being introduced on the dark jersey, while the ridiculous contrasting nameplates and their childish typeface on both kits have been replaced by sturdy, straightlaced block letters. The Jets also chose to dispense with the contrasting cuffs on the white sweater. The result is a much cleaner and more conventional look than the Jets’ original ensemble. Normally, though the cleanliness of a sweater is something I value highly, straying too far into the conventional can sometimes leave a uniform looking dated, generic or, worst of all, boring. However, whenever a team tries to implement something new and exciting, there’s always the chance the viewer’s focus will be drawn almost entirely to said element at the expense of everything else. Needless to say, they’d better get it right. With their absurd inaugural nameplates, the Jets decidedly did not, and they rightly tidied up their image for their second season, resulting in massive improvements in their on-ice aesthetics. The only real issue I can see with this uniform set is the use of a single logo between the two kits, as the blue background of the crest, when set atop the blue jersey, makes the outfit look a little drab and dreary. 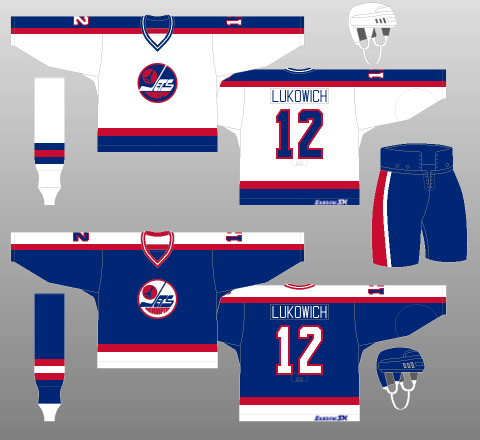 That said, when they reached the NHL, the Jets began using a white-backed logo for their blue uniforms, solving this problem by improving the colour balance of the darker kit. One interesting note is that the Jets’ pants, which underwent constant tweaking, changed, in 1975-76 (the uniforms depicted above are from the 1976-77 season, but retained said changes), to something closely resembling those of the New York Rangers. More on that later. For 1977-78, the Jets again altered their look, switching to uniforms they’d wear for the final two seasons of the WHA’s existence. Everything was made more complicated, and Winnipeg’s uniforms were the worse for it, with the dark uniforms again bearing the brunt of the assault on good taste. Most noticeable is the addition of contrasting shoulder yokes to the Jets’ blue sweaters. The staunch whiteness of these additions significantly disrupts the colour balance of the kit, making it overly saturated with white. Not only is this ill-advised design feature unnecessary on dark uniforms, it’s very hard on the eyes and, for the Jets specifically, the dark backing to their logo makes the white shoulders look doubly obtrusive. Another seismic shift was implemented in 1978-79 (the year depicted above), when the pants were switched from red to blue. Not only does this make the dark kits overly blue and altogether washed out, the change to blue pants makes the inclusion of red in the colour scheme look like an underutilised afterthought – even on the white uniforms, rather than the key component of a classic colour scheme it should be. A more minor change is the creation of a two-tone, three-stripe collar, which, though quite nice on the white sweaters, looks utterly gaudy and ridiculous on the blues. The numbers on the backs of the jerseys are much slimmer than previous iterations, while the trim of those on the sleeves is significantly thicker. Not only are these changes seemingly devoid of all reason and rationale, the two sets of numbers are now noticeably different, creating a lack of continuity throughout the uniforms. The Jets had a real good thing going but, like so many before them – and so many that would follow, they tried to tinker with a good thing, with ultimately disastrous results. The Jets entered the NHL in 1979-80, wearing uniforms that were eerily familiar to fans. You see, Jets general manager John Ferguson Sr. used to be GM of the New York Rangers. 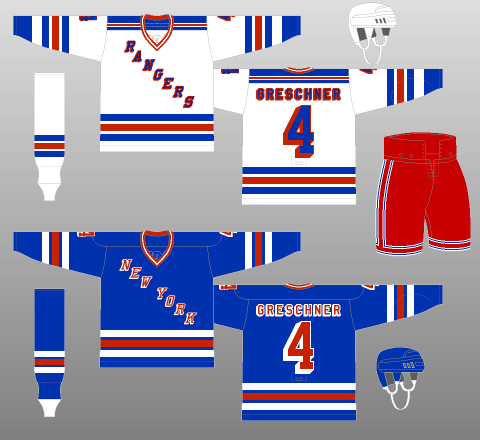 For the 1976-77 season, Ferguson Sr. completely redesigned the Rangers’ uniforms, using the template seen below. To be honest, it’s really not a bad-looking setup. 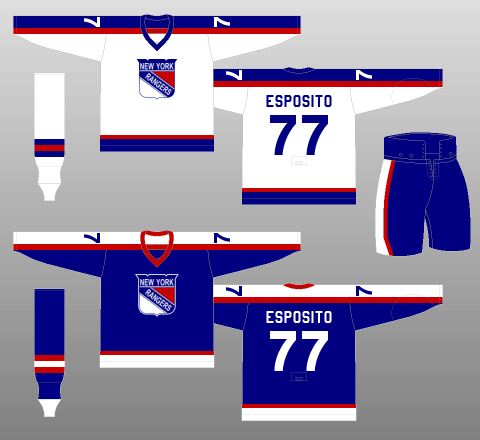 However, the Rangers already had a perfectly good thing going with their sweaters, not to mention a half-century of history behind them, and Ferguson Sr.’s changes – along with the man himself – only lasted two seasons in the Big Apple. In one of hockey’s most undercovered twists of fate, Ferguson Sr. lured Jets stars Hedberg and Nilsson away from Winnipeg in March 1978, only to be fired as GM of the Rangers that June, before being scooped up by the Jets a few months later. It’s also worth pointing out that, starting in 1978-79, following Ferguson Sr.’s departure, the Rangers began using a template for their dark jerseys that was essentially identical to that of the WHA Jets from earlier that decade. Back to the Jets’ jerseys, it was the right setup at the right time. On the white jerseys, a blue, full-length shoulder yoke is trimmed in red, complemented by a thick blue tail stripe with flush red trim. This pattern is reversed on the road sweaters, with white and blue swapping places. As for the socks, they mimicked the tail striping for 1979-80, but switched to a tri-stripe pattern the following season (depicted above). Normally, the asymmetrical nature of the tail striping would bother me but, in this case, the blue stripe on the tail of the white home jersey flows seamlessly into the blue pants, creating one clean block of colour, trimmed on top by the jersey’s red stripe, and on the pants by the red and white trim. As for the road kits, the white tail stripe contrasts nicely with the blue pants, not in such an overpowering fashion as to be hard on the eyes, but just enough to prevent the outfit from looking washed out. Speaking of contrast, as mentioned, the logo on the blue jerseys is now backed by white, enhancing the colour balance of the Jets’ road sweaters. 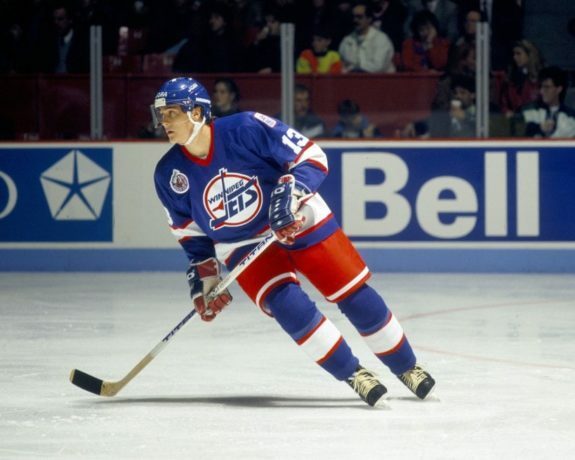 With flush-trimmed numbers added to an already exciting uniform package, the Jets took the ice during the 1980s in sleek, sophisticated kits, as crisp and clean as any in NHL history, while highly reflective of the fast-paced, run-and-gun play the 1980s favoured. My only real complaint is the tri-stripe collars which, in my opinion, are ruined by the white stripe in the middle, which sticks out like a sore thumb. Still, though, that’s not near enough to spoil this uniform set, a rare pair of jerseys that not only looked sharp at the time, but would also still look pretty darned good today. 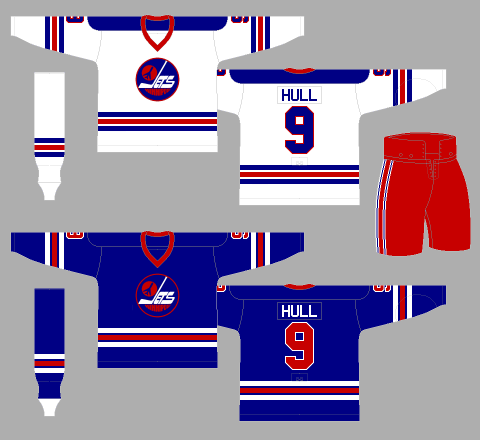 Winnipeg redesigned their uniforms for 1990-91, doing away with their Ranger heritage and debuting a set of kits that would become forever etched into the memories of their fans when the Jets left for the desert in 1996. Starting with the logo, the revamped crest moves the “WINNIPEG” part of the wordmark to the top of its “JETS” counterpart, while the image of the jet itself is now turned on its side – two changes that, in a cruel act of foreshadowing, seem to suggest movement. Of note, the Jets reverted to the use of a single logo across both their sweaters. Backed by white, the crest provides pleasing contrast on the Jets’ blue jerseys, but is dangerously close to washing things out on the home whites. Logo aside, the rest of the redesign is proof of just how stunningly beautiful a simple sweater setup can be. A slim-thick-slim striping package adorns the tails, sleeves and socks. Blue is again the dominant colour though, this time, it’s properly balanced by red in the collars, the stripes and, most crucially, the pants of the ensemble. The simple jersey template is finished off with equally uncomplicated numbers and lettering. Interestingly – and somewhat unusually, neither the names nor the numbers are trimmed. However, had they been trimmed, presumably in red, the kits might have looked overly busy. It was a courageous design choice – and one which necessitated a conscious decision, given that the Jets’ previous setup featured number trimming. While it was certainly sad to see the Jets leave for the desert, the team was visually stunning on the ice their final few years in Winnipeg – in aesthetics, if not in play. And that’s gotta count for something. In 2011, the hapless Atlanta Thrashers relocated to Winnipeg, beginning the 2011-12 season as the Winnipeg Jets. Fans who’d endured 15 years of Manitoba winters without NHL distraction could rest easy, as the Jets returned to their rightful place, much to Bettman’s chagrin. With a new colour scheme featuring silver, red and two types of blue (“polar night blue” and “aviator blue”), the Jets struck an admirable balance between paying homage to history and breaking away from the past with a modern, exciting colour palette. 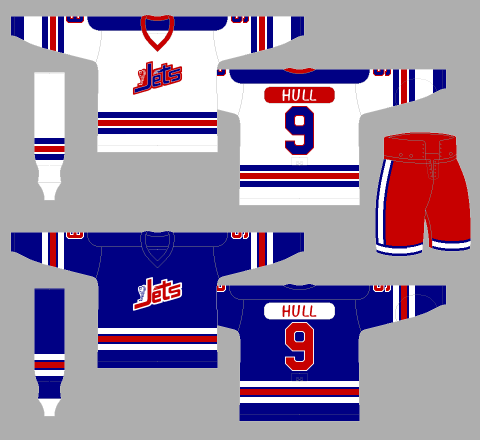 Unfortunately, when it was actually put into action, the Jets 2.0 ended up in uniforms that looked as though the designers poured a decade and a half of ideas into one ensemble. Worse still, though they debuted during the reign of the Reebok Edge uniform system, they’ve stayed the same despite the transition into the ADIZERO era. To start with, the logos are actually pretty decent. Normally, I frown upon militaristic themes in uniform design but when the team is called the “Jets,” and their city of play is home to an air force base (Canadian Forces Base Winnipeg), an exception can certainly be made. The primary crest is a blue roundel with a white background, topped by a stylised red maple leaf and a grey fighter plane. Basically, it’s the Royal Canadian Air Force’s roundel with a jet on top. The secondary emblem is made to look like an aviation patch, with a “WINNIPEG JETS” wordmark and a maple leaf atop a winged design, all backed by crossing hockey sticks. Again, thoroughly acceptable, aesthetics-wise. Even the logo used on the pants, a stylised “WINNIPEG Jets” wordmark, makes the grade. The older Jets logos would no doubt have been a hit, but these new designs ensure the rebooted team is firmly grounded in the 21st Century. Where the Jets’ jerseys really fall down is, well, everything around the logos. 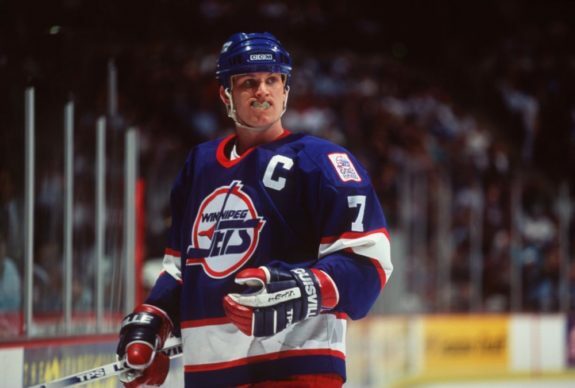 Starting with the white away uniforms, the Jets chose to go with a full-length shoulder yoke, perhaps a nod to their first decade in the NHL. That said, unlike their previous kits, the yokes are untrimmed. Whatever the case, the look is completely and utterly spoiled by the dual slim-thick-slim, tri-stripe design which also adorns the sleeves. This striping package looks fine on the socks of the kits but, on the sweater, it just looks like a pair of rubber bands wrapped around the arms. On the tail, there’s a collection of three more stripes in a completely different pattern, muddling the continuity and flow of the kits. As for the collar, it is pointlessly two-toned, given that the polar night blue outer ring is the same colour as the yoke it borders. There’s simply too much going on for my liking, and most of the design features have been poorly implemented. The home blue jerseys are somewhat better, mostly due to the lack of a full-length shoulder yoke, which makes the sleeve striping look more natural. However, the use of striping – and colour as a whole – is still rather disjointed. That’s not to say these kits are completely hopeless. As mentioned, the logos certainly hold water. The numbers and lettering use an interesting typeface. The colour palette works pretty well, though I’d like to see red used outside of the logo, along with more of the lighter, aviator blue to provide contrast with the darker, polar night blue background of the home uniforms (perhaps a stripe on the pants?). In general, taken individually, the elements of the Jets’ current jerseys are pretty inoffensive and, in some cases, refreshingly unique. However, when taken altogether, it’s a complicated, convoluted mess. Clearly, cramming 15 years of pent-up ideas into one ensemble doesn’t really work. Speaking of not really working, it seems the Jets didn’t put any effort whatsoever into their first attempt at a third jersey. 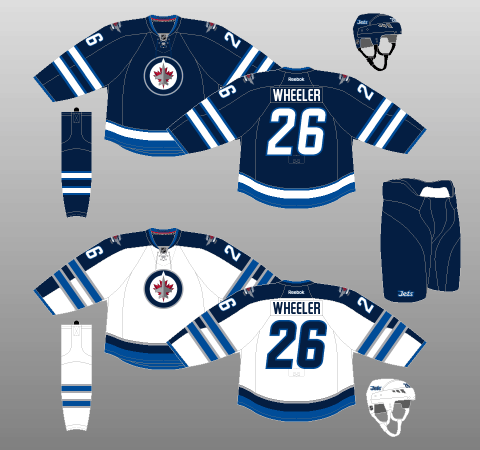 Introduced for 2018-19, Winnipeg’s alternate sweater features an aviator blue base surrounding a brand-new alternate crest, a “Jets” wordmark written out in a handwriting-like script. Starting with what the Jets actually got right, aviator blue is a great choice to colour a Jets jersey. Lighter-blue sweaters were all the rage in sports a few years back, with very few teams actually managing to pull it off adequately. I think the Jets are one of these few. Balanced out by white and polar night blue striping, the light blue base looks absolutely fabulous. Plus, its resemblance to the sky on a clear day connects with the Jets moniker. Very nice. The classic-looking numbers and lettering are direct carryovers from the WHA throwbacks worn at the 2016 Heritage Classic (more on that in a moment), also a win. Unfortunately, that’s as much good as I can squeeze out of this ensemble. As good as the light blue base colour is, the lack of red is very noticeable. Already a criminally underused colour on the Jets’ home and away jerseys, red is utterly non-existent on this alternate. The dark blue and white accents look sharp, but there’s just not enough punch or energy in the sweater to evoke any sort of endearment. The jersey template is a replication of the final uniforms of the Jets 1.0, with a slim-thick-slim striping package adorning the sleeves, tail and socks of the kit. The adherence to the past isn’t strict, however, with the numbers and captaincy letters being trimmed, unlike on the uniforms that inspired this ensemble. It’s a simple, traditional template that, when implemented correctly, would be utterly glorious. Unfortunately, that’s definitively not the case here. In contrast, this logo expresses zero connection to hockey, and only fleetingly references the team’s moniker via a completely buried design feature. The press release notes, “It [the logo] is highlighted with the “t” in “Jets” being crossed with the outline of a fighter jet.” “Highlighted” is the key word here, because there’s absolutely no way the average person was seeing it otherwise. 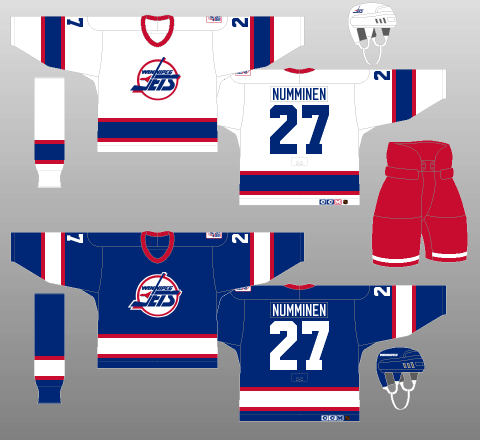 It isn’t even adequate as a nod to history, as the homage paid to the aforementioned previous jersey template completely overlooks the sweater worn by the Ottawa RCAF Flyers when they won Olympic gold in 1948 – a sweater replicated by the Jets’ American Hockey League affiliate Manitoba Moose. I’m not quite sure how it’s possible, but Winnipeg’s somehow managed to make the aesthetics for a team called the Jets – one of the most exciting and aggressive mental images imaginable – completely and utterly boring. The Jets’ first attempt at an alternate jersey can be compared to having to explain a joke. Sure, you might be able to guide someone through the mental gymnastics necessary for them to understand it, but the explanatory process sort of ruins the effect. More to the point, the responsibility for immediate appreciation of the joke falls on the joke-teller, not the recipient. The Jets produced a flabbergastingly dull and boring third jersey that still remains dull and boring no matter how much they try and explain it. In 2016, the Jets faced off against the Oilers in the NHL Heritage Classic, a game best remembered for Winnipeg’s absolutely spectacular throwback jerseys. Combining the best design elements of their WHA years with a darker, more aggressive blue, the Jets proved they’re more than capable of the exceptional. My favourite detail? The tiny Jet in between the stripes of the pants. Simply marvellous. If the Jets were to bring back this wonderful sweater as an alternate kit – or even as a full-time road uniform, presumably with a complementary home jersey (perhaps in aviator blue), they might well be amongst the league leaders in jersey sales. Instead, they went with an entirely new – and entirely nonsensical – design. I respect the notion of creating something new rather than rolling out a retread, but I simply cannot abide the outcome. Here’s hoping they come to their senses. Ultimately, I’m just confused as to what the Jets’ marketing strategy is. Sure, you’ll sell jerseys to Winnipeg fans; like any fanbase, Jets fans will no doubt eagerly scoop up whatever swag comes their way. However, the NHL stretches across North America, and hockey itself is an international game, so any strategy to sell jerseys – to build a brand, in general – should also take into account the tens of millions of non-Jets fans. 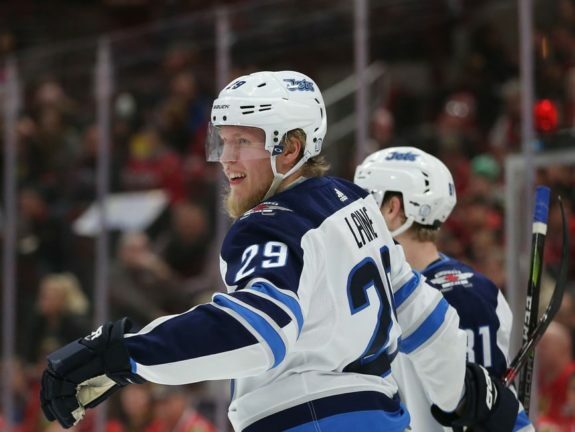 Winnipeg is awash in marketable stars – Patrik Laine, Blake Wheeler, Mark Scheifele, Dustin Byfuglien…, so it stands to reason people outside of the Jets’ sphere of influence might be interested in a Winnipeg sweater. Unfortunately, the Jets 2.0 have yet to come up with anything remotely appealing to anyone outside of their core constituency, which is a real shame, especially considering Winnipeg’s glorious back catalogue.